The creators of this black-cast slasher opus did themselves no favors by titling it THRILLER, which will automatically put many people in mind of Michael Jackson’s landmark album and, more pertinently, his longform werewolf-and-zombie-themed music video. That minimovie represented a significant achievement of an African-American artist taking on classic genre tropes and putting his own cultural and creative stamp on them. 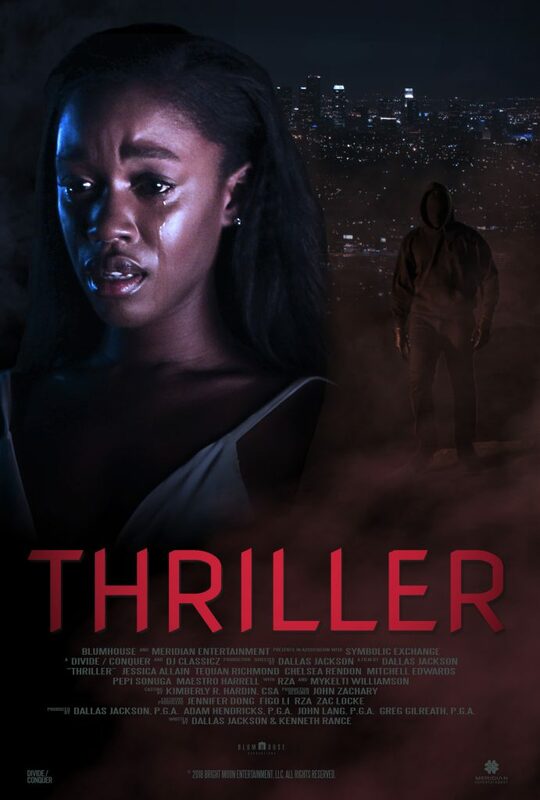 The new THRILLER (premiering today on Netflix), on the other hand, simply plugs actors of color into a thoroughly generic stalk-and-slay scenario populated by characters we’ve seen dozens of times before. This isn’t even the first time that’s been done; H.M. Coakley’s HOLLA duo aren’t much more imaginative, though at least they pull a few clever tweaks on the clichés (like killing off the token white characters first). One of THRILLER’s disappointments is its refusal to have fun with the ingredients, as if doing so might compromise its mission of diversity. The script by Dallas Jackson (who also directed) and Kenneth Rance owes a particular debt to 1980’s PROM NIGHT, beginning with a prologue that’s almost identical: A mean-spirited prank pulled by a bunch of kids in an abandoned building leads to the falling death of a young girl. Weirdly, the sequence then plays as if the rest of the group pin the crime on someone innocent, even though they and we have seen their withdrawn classmate Chauncey, whom they were harassing, push the victim to her demise. Cut to four years later, with the now-teenagers attending Compton High School, and all the archetypes are laid out. There’s good girl Lisa (Jessica Allain), haunted by guilt about the incident that gives her nightmares; her jock boyfriend Ty (Mitchell Edwards), whose father reminds him that college scouts are going to be at the big game that weekend; Ty’s angry ex Gina (Paige Hurd), who won’t let go (“This ain’t over!”), and so on. There is one oddity—Kim (Pepi Sonuga), the sister of the opening-scene victim, talks to herself in the voice of her dead sibling a couple of times, but this tic never goes anywhere as a red herring or anything else. Meanwhile, Chauncey (Jason Woods) has just been released from jail, and a hoodied, masked figure that everyone assumes to be him starts shadowing and chasing Lisa and her friends, though he takes quite a long time to get down to any serious killing business. The long stretches between murders are filled in with material that keeps promising to take advantage of its specific milieu, but never actually does. Though a couple of early scenes pay lip service to issues of inner-city/black-on-black crime, THRILLER doesn’t do anything substantial with the idea of setting a teen-kill narrative in an environment where the threat of violence is such a constant that a guard/bouncer is required at a house party. The art behind the credits raises the notion that Chauncey’s prison stint only hardened him to make him more prone to violence, though it’s never addressed in the movie proper either. On a more general level, THRILLER doesn’t even take any interesting advantage of the fact that these imperiled youths, unlike their ’80s counterparts, can instantly take and share cell-phone photos of the menacing figure lurking around their neighborhood. Instead, the movie dutifully trots out all the expected beats on the way to the big climactic Homecoming-dance slaughter, while Gina ropes her friend Dre (Tequan Richmond) into helping her plot CARRIE/PROM NIGHT-esque revenge on Lisa and Ty. Most crucially, even once maybe-Chauncey starts killing in earnest, THRILLER just isn’t scary. While the young actors are all personable enough, their roles are too formula-bound to honestly engage us, nor is there enough invention or panache put into the stalkings and killings. No one’s expecting every chiller featuring POC to be GET OUT, but there should have been more ambition here to set it apart beyond the racial makeup of its ensemble. Nor should a film this imitative call attention to the fact in its own dialogue. “You sound like one of those paranoid white girls in a scary movie,” says Detective Johnson (Mykelti Williamson) when Lisa goes to him for help—as if everything else in THRILLER isn’t also stuff seen in countless past scary movies about white girls.